Not an easy place to get to, but anyone who tries will be rewarded with a selection of endemics that very few people have ever seen. 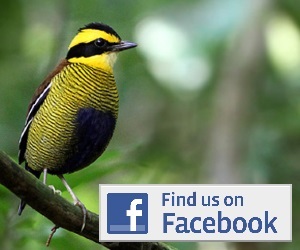 Wetar has only been visited by birdwatchers a handful of times in the last few years, so it is still early days in its ornithological exploration. The sites suggested here are definitely just that; suggestions: you should consider trying anywhere that looks interesting. It is also worth keeping an eye out for seabirds as you move between locations, as the seas here can be productive for Greater and Lesser Frigatebird, Red-footed Booby, Streaked Shearwater, Matsudaira’s Storm-petrel and occasional skuas. Starting from the large north coast village of Lurang, a new road has been created crossing the island to the south coast village of Ilwaki. While undoubtedly this road will lead to damage to the forest interior, at the moment it currently passes through relatively undisturbed forest for large sections, and allows relatively easy access to the Lake Tihu area, around 25km south of Lurang and a similar distance north from Iiwaki. This is currently the most accessible interior forest on the island and allows a chance at birds including Wetar Ground-dove , Slaty Cuckoo-dove, Pink-headed Imperial-pigeon, Timor Imperial-pigeon (present to sea level on Wetar, but more common at higher elevations), Rainbow [Marigold] Lorikeet, Olive-headed Lorikeet, Iris Lorikeet, Olive-shouldered Parrot, Wetar (Moluccan) Scops-owl, Black-chested Honeyeater, Crimson-hooded Myzomela, Wetar Figbird, Plain Gerygone, Fawn-breasted Whistler, Olive-brown [Wetar] Oriole, Timor Stubtail, Timor Leaf-warbler, Orange-banded Thrush, Timor Blue-flycatcher, Red-chested Flowerpecker, Flame-breasted Sunbird. This village on the NW coast backs onto some reasonable areas of degraded forest that can be quite productive for birds, with species including many of the same birds as the Lurang-Lake Tihu area, as well as Tricoloured Parrotfinch. Situated on the north coast, these small villages back onto a large area of forested hills, including the the Bekau Huhun Nature Reserve. Deep river gorges head in from the coast and stretch deep into undisturbed forest. Following the start of these valleys for a few kilometres is easy, but may well involve wading through water occasionally, as there is not always an obvious trail. Exploring further will probably involved a small expedition of several days, but the reward is some of the most pristine habitat on Wetar. 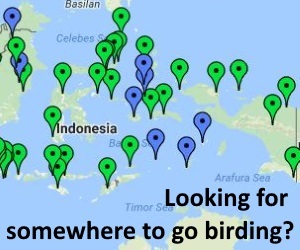 Birds seen or possible in this area include as similar range as Lurang-Lake Tihu, but especially including the pigeons such as Timor Black Pigeon, Pink-headed and Timor Imperial Pigeons, Bar-necked Cuckoo Dove and Wetar Ground Dove. Another river gorge, stretching inland from the north-east coast village of Sakir. A trail follows the river and passes through some great condition riverine forest. Birds seen here are also similar to those present in the Lurang-Lake Tihu area. The south-east coast village of Masapun backs onto a range of forested hills, with deep gorges cutting into them from the coast. This area would be well worth exploration, and likely to hold many of the same birds as other sites nearby. Getting to Wetar is not straightforward. There are no scheduled flights to the island, so your only option is by boat. Administratively the island lies within Maluku Province (not Nusa Tengarra, as you would imagine) so you might well find yourself travelling from Ambon. At time of writing the options for getting to Wetar include ‘regular’ but infrequent boats from Ambon (often via Tanimbar; ), Kupang (Timor), or Kalabahi (Alor). Some of these stop at Lurang on the north coast, but more frequently (in relative terms!) they stop at Ilwaki on the south coast. Finding info on schedules for smaller boats can be tricky outside of the respective ports, but for larger Pelni boats (Ilwaki and Kisar, might be only “KM Tatamailau”) at least try the website www.pelni.co.id. There is also an option to fly to the small island of Kisar (to the South-east of Wetar) on a once weekly Merpati flight from either Ambon or Kupang. From there you will need to pick up a rare scheduled boat (as above), or try and arrange an expensive charter for the 100km crossing. Alternatively you may be able to hitch a ride on a mining company charter? Once on Wetar things are not necessarily going to get easier. The human population on the island is very low (among the lowest in Indonesia), so finding a team of people to help mount an mini-expedition to the interior could be tough! To get a feel for things first probably best to base yourself in either Lurang or Ilwaki and venture further from there using small charter boats to get along the coast, or whatever transport you can find to explore the cross island track. You also won’t find many hotels, so be prepared to report to the village head when you arrive in each destination and ask for assistance in finding board and lodgings (and expect to pay, even if you are not directly asked). The village heads may also be able to assist you finding local guides (if you are both polite and patient!). Wetar is remote, with few facilities, so prepare well and pack accordingly will anything you might need. The more flexible you are with time the more relaxing time you will have!